I do lots of email etiquette training and have written extensively about email but there are 3 annoying email etiquette habits that have been on my mind lately. One came to me as I found myself disagreeing with CBC radio guest contributor Lucy Kellaway of the BBC and Financial Post about email etiquette (I’m sure she’s crushed). The next two were annoying email etiquette habits I noticed others were commenting on in social media. So – with all of this ‘listening and noticing’ going on, I did what I often do… I write a blog post. If you’re like most people, when we write an email we open a blank screen and start typing. What happens over the next minute or two is that as we type, more information about what we should know and/or ask bubbles to the surface. Email evolution takes place. When we’re done all the information/questions is likely there, but chances are the logical flow of our email might look like a Family Circus© comic strip. We have to remember that 10 different people can read the same words and depending on their education, experience and objectives they will interpret those words 10 different ways… ESPECIALLY in an email. When we add to the mix that email evolution just happened, we are almost guaranteed to confuse and frustrate our reader, (you know I’m right because you’ve received email like that). Family Circus ©Bil Keane Inc.
Bottom line your email by putting the important information and action item at the top and background / support information after. Confirm that you wrote with your readers needs and knowledge in mind. If you don’t, they will likely have to make assumptions – and that’s the beginning of a whole list of mistakes waiting to happen. Is there any information that is not longer needed and/or a sentence you can shorten? The less time they need to read the more likely your message will be read and acted on. If I sent you a file you requested, how do I know you received it if you don’t reply? A simple ‘Thanks’ does the trick. 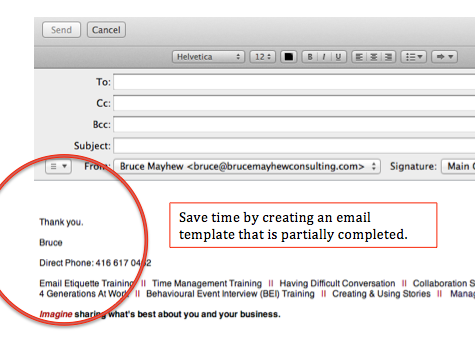 You can even save the 2 seconds it would take to type the reply by creating a partially completed email template (see the template I’ve included in this post as an example). Always use a signature block which includes a phone number your reader can use to get hold of you. You don’t need to include your private number, but everyone should be able to leave you a verbal message (at least). I was listening to CBC radio 1 a few weeks ago and Lucy Kellaway was on saying the exact opposite; the last thing she wants to share in an email is her phone number. If you are a public figure that makes sense… but for the average business email that you are purposefully engaged in, phone numbers are important. Email is a terrible brainstorming tool and as mentioned above, details can easily be misinterpreted or overlooked. There are many times when your reader will realize a 2 minute conversation or voice mail can replace days of back and forth email, frustration and misunderstandings. Note: If you use an email management system like Outlook, you’ll need to activate a send AND reply email signature block, (many people only activate their send). Every time you send an email you are advertising your personal and professional brand. What message do you want to send? Happy communicating and email etiquette. Please share and/or Tweet this post if you like it. It’ll only take a moment and will help us both share thoughtful business best practices. Some popular ‘It Feels Good To Share‘ links are at the end of this post. Bruce Mayhew Consulting facilitates courses including Email Etiquette, Managing Difficult Conversations, Mindfulness and more. Give us a call at 416 617 0462. We listen. Click on the image to the right to watch us on Canada AM. Give us a call at 416 617 0462. We’ll listen. Family Circus created by cartoonist Bil Keane and currently written, inked, and colored by his son, Jeff Keane. King Features Syndicate. Number 2 is very frustrating if not followed. As for auto signatures, I agree with your position, forget what the commentator said.